The electronic slide rule SR-16 was the last calculator using the extreme wedge shaped housing of the SR-10 and SR-11. It was superseded by the SR-16 II in a more conventional housing within one year. With the SR-40 prototype an upgraded version of the SR-16 II was developed but never introduced to the market. The colorful design of the SR-11 was dropped for a style similar to the later SR-50A. Technically the calculator was very similar to its predecessors, one interesting feature could be found in the higher accuracy of some calculations. If you are interested in the calculating accuracy of scientific calculators, don't miss the Calculator forensics. The internal construction of the SR-16 is similar to the late SR-10 Version 3, compare them yourself. In the meantime we discovered another version of the SR-16 with an unusual display. The production date is wk 37 year 1975 (Serial No 114394) but we assume that it is the result from a repair business. The SR-16 could be called a rare calculator. Interested in really rare calculators ? View the TI-150 ! 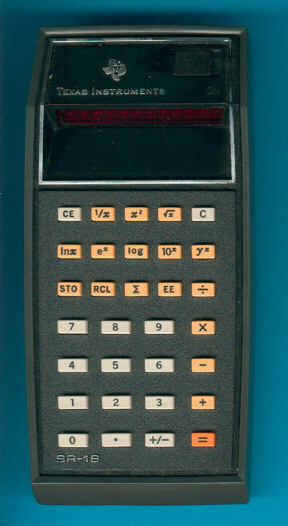 The TMS1001 used in this calculator was the first LSI MOS chip of the TMS1000 family. The picture at the right gives you a comparison between the first TMS1000 based calculator chip and one of the last ones found in a TI-30 STAT manufactured 13 years later. In the meantime we located a BA-35 Business Analyst manufactured in 1996 using a CD4571B, based on the TMS1000 family, too.